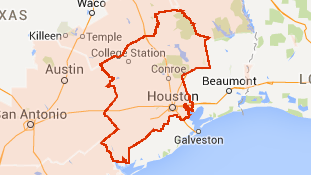 Harris County, TX: Flash Flood Watch in effect from 1 am CDT Monday through 1 am CDT Tuesday. Flash Flood Watch remains in effect through late Monday night. The Flash Flood Watch continues for. A portion of southeast Texas, including the following areas. Austin, Brazos, Burleson, Colorado, Fort Bend, Grimes. Harris, Houston, Jackson, Madison, Montgomery, Polk, San Jacinto, Trinity, Walker, Waller, Washington and Wharton. Periods of showers with isolated thunderstorms will be capable of moderate to heavy rainfall late tonight through Monday afternoon, with the heaviest rainfall expected to occur Monday afternoon into Monday evening. Widespread 2 to 4 inches of rainfall is expected with locally higher amounts possible across the watch area.